We are thrilled to share that Atelier Van Lieshout’s Humanoids are now on display in the Collins Canal Park in Miami Beach! The Humanoids is a group of statues that consists of nine aluminum sculptures and is the product of Joep van Lieshout’s ongoing fascination with man, machine and humanity. 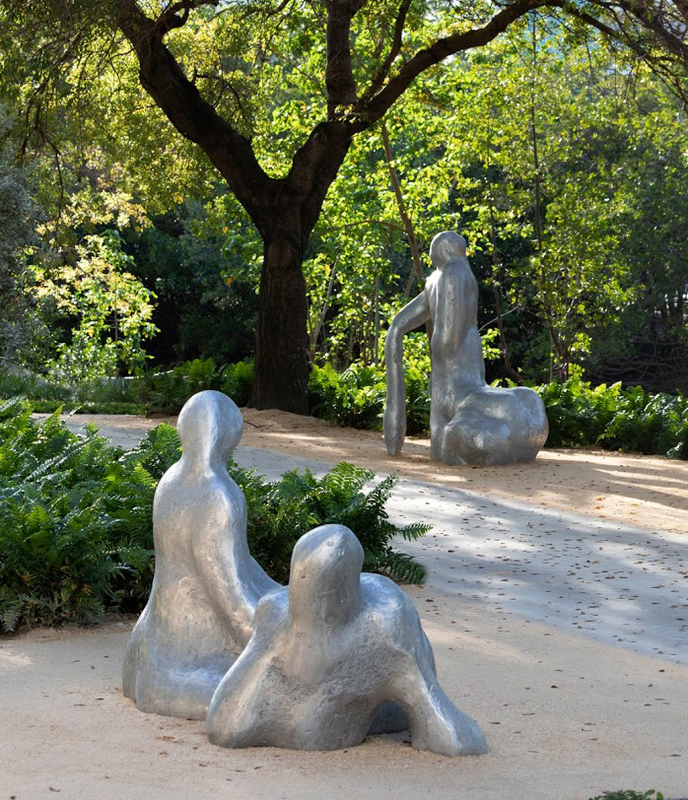 They appear as abstract figures, which use the park and the natural environment as their habitat, formulating a subtle statement about our relationship to nature and our origins. The sculptures will be placed throughout the park, along the canal and amidst the trees. The Humanoids allow you to engage with them as you write, walk, think or talk in the park. Other artists that featured their work at the Miami Beach Convention Centre are Franz Ackermann, Elmgreen & Dragset, Ellen Harvey, Joseph Kosuth and Sarah Morris. 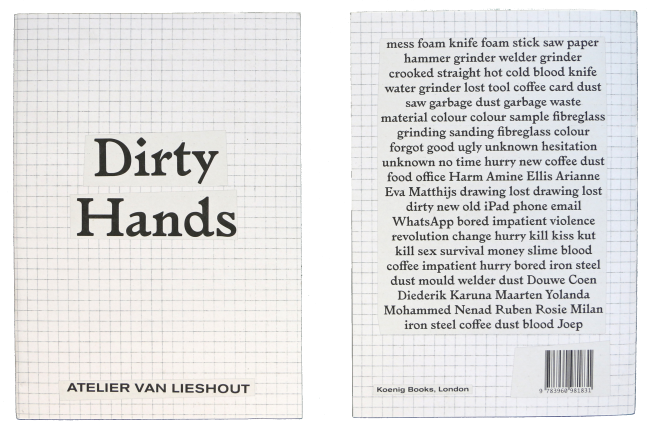 Our latest book Dirty Hands is out now! Click here to download Atelier Van Lieshout publications such as New Tribal Labyrinth, Slave City and A Manual. Atelier Van Lieshout is the studio founded by sculptor Joep van Lieshout. After graduating at De Ateliers, Amsterdam, Van Lieshout quickly rose to fame with projects that travelled between the world of easy-clean design and the non-functional area of art: sculpture and installations, buildings and furniture, utopias and dystopias. With this body of work, comprising both autonomous and commissioned artworks, he has gained a strong international reputation. We are proud to announce that the artwork Wombhouse (2004) was in the collection of Antoine de Galbert and is now being donated to Centre Pompidou in Paris! Its shape is exciting, poetic and beautiful. The womb contains a bedroom – the uterus is considered the safest place in the mind of human beings – heating, air-conditioning, electrical systems, kitchen and shower, while the ovaries contain the toilet and the mini bar. The Womb can make any space function… The Wombhouse is a paradise to live in. As a contemporary form of commercialized nostalgia, souvenirs are the ultimate cliche in the representation of a city. Pocket-sized, acritical, and cheap, they populate tourist sites all over the world with a patina of innocence. Souvenirs produce collective imaginaries made up of lines that follow the profiles of superlative sculptures, buildings, and stories. They have become the reference points that anchor a particular culture in time, representing (consciously or not) political, cultural, and social values. Manifesto Series: Souvenirs for an Ideal City is organized as part of Storefront’s current exhibition, Souvenirs: New New York Icons. The event invites an international group of architects, designers, photographers, curators, and researchers to reflect upon the objects and imaginaries that define the global city. Participants will reimagine the icons of the city, and will present manifestos for new “souvenirs for an ideal city” in an effort to explore the concept of iconography and what icons mean for the city today. The Manifesto Series is one of the Storefron’s ongoing event series formats. It seeks to encourage the formulation of positions and instigate spirited discussion and exchange in a dynamic and polemical context. The format therefore differs from that of other talks and presentations. Rather than putting forth a synthetic lecture or a series of projects, participants are invited to deliver a concise, point-by-point manifesto, with the hope that their positions will provide the grounds for discussion to test various hypotheses in real time. Atelier Van Lieshout, Carpenters Workshop Gallery and FIAC are proud to present Domestikator at the Centre Pompidou! After the Musée du Louvre decided the sculpture was too provocative for the Jardin de Tuilleries, the artwork will now be installed at the square next to the Fontaine Stravinsky. Joep van Lieshout: “I’m very pleased that the Centre Pompidou was able to see beyond the sensationalized interpretations of this work, and offered to present it during FIAC. By exhibiting this work, the institution is not only allowing the public to properly experience its artistic and intrinsic values, but it also opens up a broader discussion about the current challenges and complexities in the relationships between artists, institutions, public, and press – and their subsequent impact on artistic freedom. Domestikator was always intended to be a catalyst for thought, as it addresses the very serious issue of how humans employ technology – with ingenuity, creativity, sophistication and persistence – to change the world into a “better” place, often domesticating it in the process. In order to push the boundaries of human experience and longevity, we have developed new technologies, like artificial intelligence, genetic manipulation, robotics and industrial farming, which push our ethical borders, without any real understanding of the long term consequences. I am pleased that visitors to the Pompidou will have the opportunity to experience this work and hope that it generates questions and dialogue around the complexity of the issue of domestication – particularly its inherent hypocrisy, and the disconcerting fact that we are still without any real policy or regulation to govern this increasingly intrepid behavior. A public program will take place around the Domestikator, please check this site or facebook for regular updates! Atelier Van Lieshout is proud to be part of the opening exhibition of the new Centro Arte e Scienze Golinelli in Bologna, Italy. The exhibition, with the title Imprevedibili, essere pronti per il futuro senza sapere come sara (Unforeseable, being ready for the future without knowing what it will be like), shows a selection of works which all reflect on a possible future, including Atelier van Lieshout’s Cow of the Future and Food Reaktor. For the duration of the exhibition Öğüt & Macuga Episode 2: The Show Is Over at Witte de With Center for Centemporary Art, ‘guest readers’ are invited to interpret, critique, analyze, translate, and disrupt the very choices made in the exhibition. Each invited ‘reader’ responds to the exhibition drawing from their own background and interests, opening up the documents and works on view to new interpretations and perspectives. Throughout the Fall of 2017, public tours of Öğüt & Macuga Episode 2: The Show Is Over will be given by: Joep Van Lieshout (Artist), Dirk Snauwaert (Director WIELS, Brussels) and Charles Esche (director Van Abbemuseum, Eindhoven). We’re happy to announce we will be showing a mini retrospective at Expo Chicago at the Carpenters Workshop Gallery booth. The exhibition is a chance see a selection of works from projects such as CryptoFuturism, New Tribal Labyrinth, SlaveCity and Technocrat. A solo exhibition by Joep van Lieshout, Furnification features the results of the artist’s recent sculptural experiments that that form part of the series, CryptoFururism. By revisiting the Italian Futurists, the series explores resonances with emerging fascist tendencies today, revealing the interplay between utopia and destruction. In Furnification, van Lieshout not only pushes the limits of materials, but also questions civilization itself. On August 27, 2017 the first edition of ART Break will take place. This festival will transform the beach of Hoek van Holland into a celebration of art and coast. With ART Break Hoek van Holland finally has its own festival. From an art installation, classical music to a live painting performance and a treasure hunt through the Atlantik Wall, ART Break is for everyone! The initiators of the festival, the entrepreneurs of the Rechtestraat, want to show how special Hoek van Holland is and how much culture this beach town has to offer. ‘’Hoek van Holland has six museums and is a place where a lot of Rotterdam-based artist take their summer break, but a lot of people aren’t aware of this’’, says Freek Ruigrok of DeSurfschool.nl, one of the entrepreneurs. The eye catcher of ART Break will be Atelier Van Lieshout’s Bikinibar laying on the beach! The Bikinibar was created in 2006 as a place where people can withdraw from the busy beach life or bad weather. But it is only now that she can finally lay on the destination where she was intended for: the white sands of Hoek van Holland. The festival takes place on Sunday the 27th of August 2017 and starts at 10 in the morning until 6 in the evening. The programme offers a wide range of activities for visitors of all ages such as surfing lessons for children, a hip-hop workshop, but also various concerts and a live painting performance by Solko Schalm, the unofficial port painter of Rotterdam. The festival can be visited free of charge. Hope to see you there! 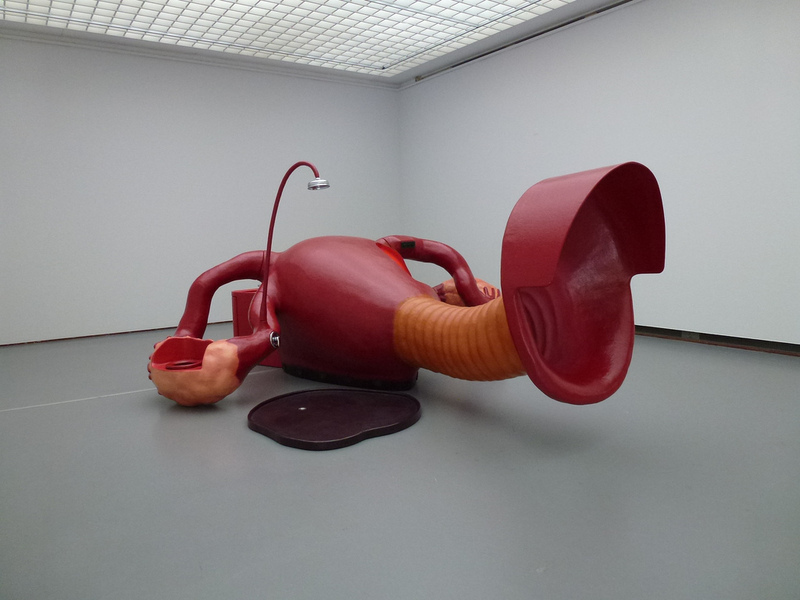 For the third and last time Atelier Van Lieshout will use the interplay of grouped works and individual pieces to transform the outside the Jahrhunderthalle Bochum into a powerful and highly topical installation. Alongside the new works, familiar pieces from the previous two years can also be found including the ‘Domestikator’, ‘BarRectum’, and the ‘Sanitary Silos’. The ‘Refektorium’ will host a wide-ranging programme of free events which establishes connections to van Lieshout’s art and to other Ruhrtriennale productions. The installation and with it the Ruhrtriennale festival centre will be opened on 18th August at 4.30 pm in the presence of the artist. July 14 will see the opening of Façade 2017, where you can see Huis (2017) by Atelier Van Lieshout. Huis presents the audience with a deconstructed, distorted cage; a disfigured prison that symbolizes the human longing for freedom. In addition, Atelier van Lieshout captured the deconstructive process of Huis in collaboration with filmmaker Sonia Herman Dolz. The straight-edged cage was pushed apart with the use of heavy, self-made machines – i.e. a large drop hammer and hydraulic press with pressure. This film will be on display at CBK Zeeland, Middelburg. At this year’s Art Basel, Atelier Van Lieshout is proud to be represented by Galería OMR, Carpenters Workshop Gallery and Galerie Krinzinger – who are showing Model La Machine Celibataire (2012) at their booth. Visitors and residents of Amsterdam are once again welcome to visit ARTZUID, this time for it’s 5th edition. Presented as a 5km art route you are guided past 60 monumental art works from Dutch and International abstract artists. The outdoor exhibition is being brought to you by Rudi Fuchs, art historian and former director of the Stedelijk Museum Amsterdam. With a duration of 4 months and free entry, visitors can also partake in one of the daily guided tours or guest lectures in the surrounding hotels and museums. For more information and locations please visit the ARTZUID website. This weekend will see the 2017 edition of Gallery Weekend Berlin with the work ‘Kiss ‘by Atelier Van Lieshout on show at sculpture garden of König Galerie. König Galerie celebrates Gallery Weekend Berlin with three new solo exhibitions. The sculpture garden at St. Agnes, which was first inaugurated a year ago, is also being largely redesigned for the occasion. For more information please check the gallery website. A full program, including a map with all participants of the Gallery Weekend Berlin can be found here. Location: König Galerie St. Agnes, Alexandrinenstrasse 118 – 121, Berlin.